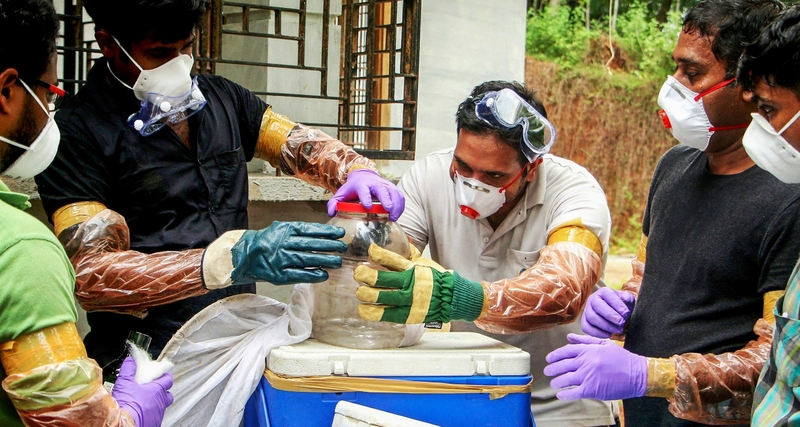 The World Health Organisation has been informed about the outbreak of the virus in Kerala. New Delhi: The Nipah virus has so far claimed ten lives in Kozhikode and Malappuram districts in north Kerala, while the condition of two persons undergoing treatment for the viral disease is said to be critical, health minister K.K. Shylaja said today (May 22). The World Health Organisation has been informed about the outbreak of the virus in Kerala, she told reporters. Two persons – Rajan and Ashokan, who were undergoing treatment at Kozhikode and died this morning, have been confirmed to have contracted the virus, she said. A nursing assistant, Lini Puthussery, who died yesterday, had also contracted the virus, she added. A note Puthussery left for her husband has been widely read, with many pointing out how her death highlights the risks involved in being a healthcare worker. “Saji Chetta, I am almost on my way. I don’t think I will be able to see you. Sorry. Take care of our children properly. Our innocent child, take him to the gulf. They shouldn’t be alone like our father. Lots of love,” her note says. Kerala chief minister Pinarayi Vijayan said nurse Puthussery’s “selfless service will be remembered”. Twelve out of the 18 samples sent for testing have tested positive for the virus, of which ten people have died. Two deaths reported on May 20 from Malappuram – Sindhu and Sijitha – also tested positive for the Nipah virus. The two had come to Kozhikode Medical College Hospital for treatment and had been in touch with one of the infected persons who had died of the virus, the minister said. No fresh case has been reported so far, she said. Shyalaja said Union health minister J.P. Nadda, who is in Geneva, had called her and enquired about the situation in the state, and promised all possible help from the Central government. An expert team from the National Centre for Disease-Control, including its director Dr Sujeet Kumar Singh and head of epidemiology Dr S.K. Jain, are already in Kerala. A high level team from AIIMS has also reached the state, she said.